If Erik hadn’t challenged me to do a triathlon, this would have been just an ordinary Saturday. 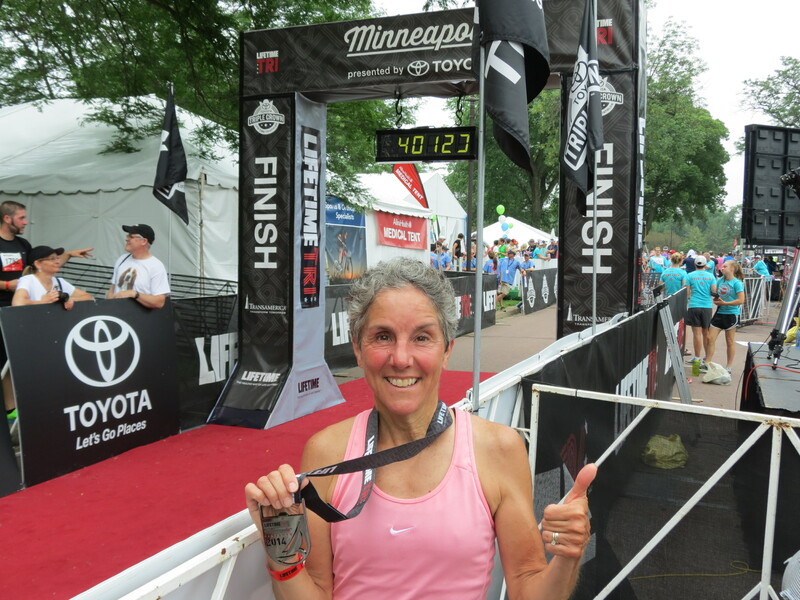 And I might never have had the courage go give it a “tri.” Instead, I spent the morning swimming-biking-running in the Lifetime Tri. And loved it! On the way to the race, I happened to check Facebook on my phone, and found several good wishes for my race. But most important were the ones that said “have fun.” It was just the message I needed to hear, and helped me keep my focus on fun for the entire morning. When I was tempted to worry too much or feel myself getting too serious or competitive, I was able to return to the Fun theme. We set off for the swim in pairs every few seconds. The line moved quickly, and before I knew it I was splashing into the water. The temperature was fine (thankfully, since I had no wetsuit) and the waves were minimal. The lake was so murky that I couldn’t even see the swimmers right next to me, so I just forged on. Fortunately, we were reasonably spaced out. Staying on course was a challenge, though, as I kept finding myself drifting away from the buoys. I’m sure I did more than my share of the .93 mile distance. My transition to the bike didn’t set any speed records. But I didn’t care. Fun, remember? And I made it without incident. Cycling turned out to be a lot less stressful than I expected. Perhaps because I was near the back (youngest go first) we were weren’t the least bit bunched up and there was plenty of room on the roads. And every intersection was well marked. They were right about the bad pavement, though – Minnesota winters left rough spots all up and down River Road. But once we got to Minnehaha Parkway, it was smooth sailing and easy riding. I especially enjoyed that bit. My pace was fast for me, and it felt good to press a good steady speed for 24 miles. But let’s face it, I’m not a racing cyclist. I’m convinced that most of the small crowd behind me passed me along the way. Transition two was quicker. As was my run. Finally, I was in my element. 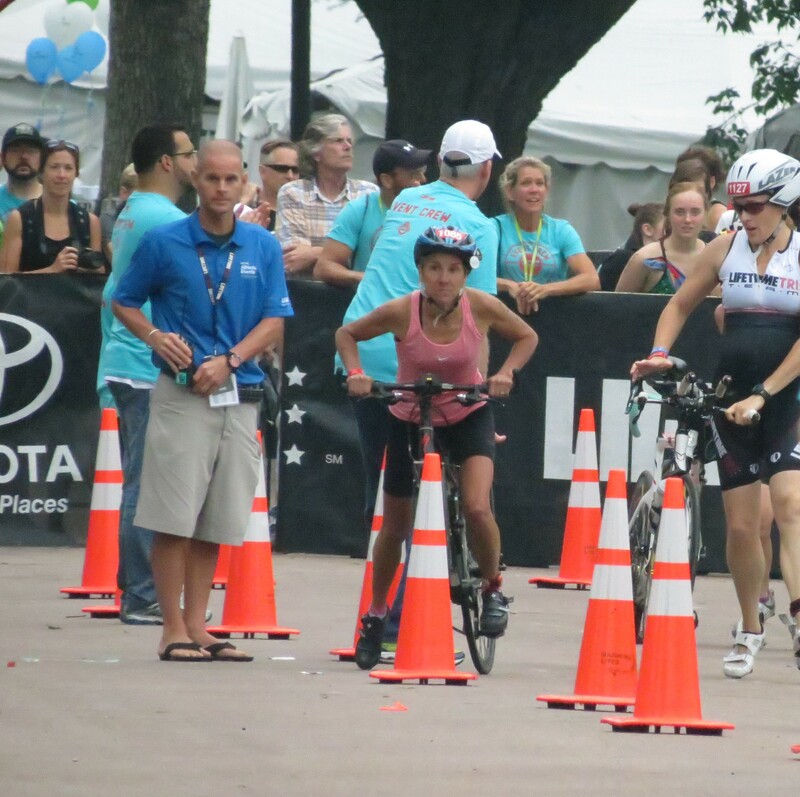 Before I was even out of the transition area, I’d hit stride and I was booking it down the running path. Yes, that is my sport! I loved the strong kick I felt, surging forward while everyone else adopted a tired shuffle. Passing runner after runner gave me such a high, and I conveniently ignored the fact that I was merely regaining the ground I’d lost on my bike. Rich and Erik were out on the course, cheering me on all along the way. But they really made their mark on the running segment. 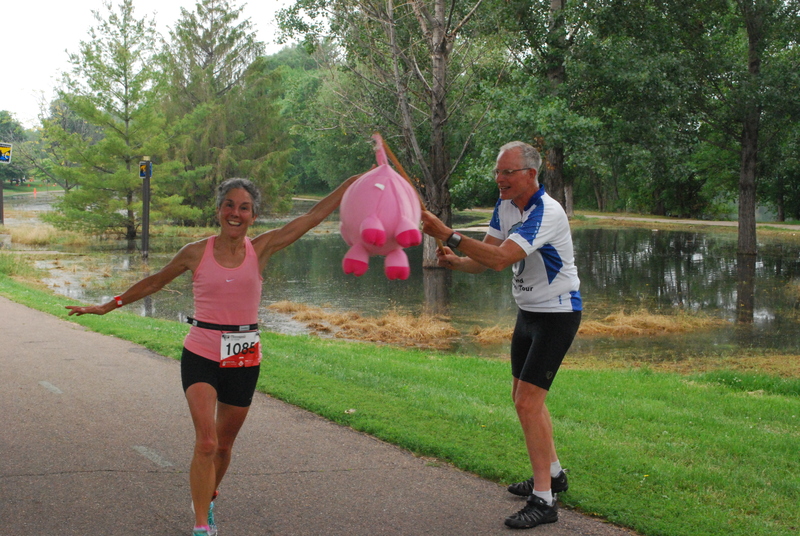 To help me see them, they initiated “Tri Pig” which truly served its purpose – I could spot them from well down the course. 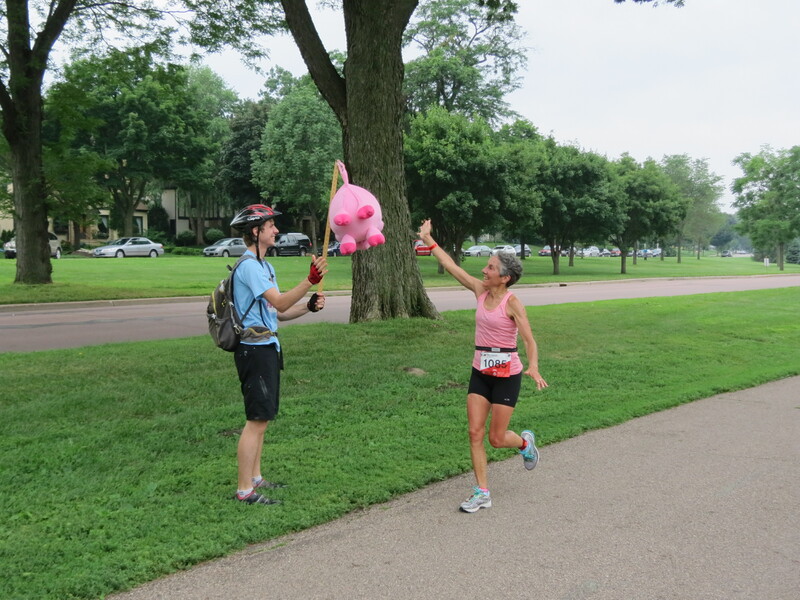 With Tri Pig they entertained many a runner, chanting “Feel the Power of the Pig” as folks went by. I’m sure they raised more spirits than just my own. The final mile of the 6.2 mile run seemed endless. Rich and Erik cycled alongside the course yelling encouragement, and I managed to push on to a strong finish. And oh, it felt so good! My overall time was 3:08:53. My swim and bike times were about what I expected, and I blew away the run with 8:08 minute miles – a pace I haven’t done in years! I even placed first in my age group for the run. It certainly was no ordinary Saturday. It was a very successful Tri. Especially for my first one. 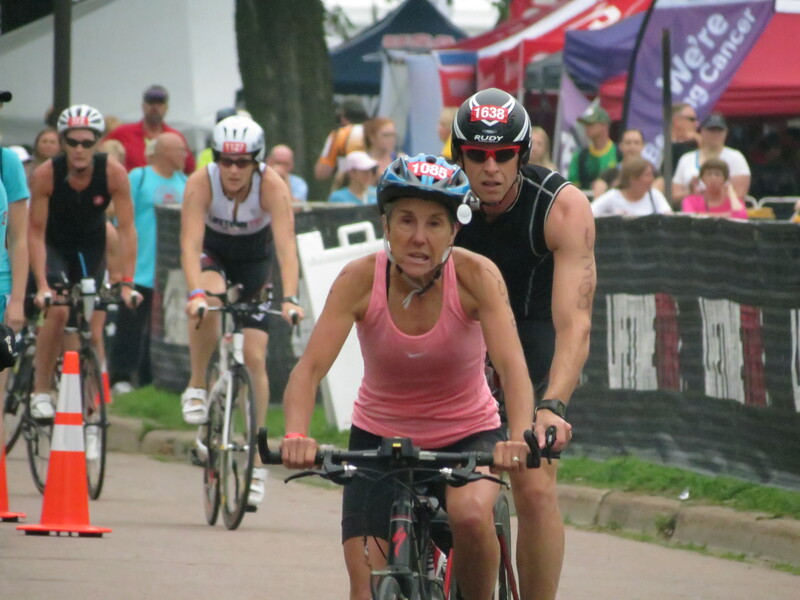 This entry was posted in Keeping Fit and tagged Cycling, Running, Swimming, Triathlon by Molly. Bookmark the permalink.